Marine Drive is a 3.6-kilometre-long Boulevard in South Mumbai in the city of Mumbai, India. The road was constructed by late philanthropist Bhagojisheth Keer & Pallonji Mistry. It is a 'C'-shaped six-lane concrete road along the coast, which is a natural bay. 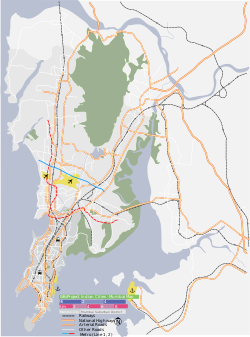 The road links Nariman Point to Babulnath and Malabar Hill. Marine Drive is situated on reclaimed land facing west-south-west. A promenade lies parallel to this road. Marine Drive is also known as the Queen's Necklace because, if viewed at night from an elevated point anywhere along the drive, the street lights resemble a string of pearls in a necklace. The official name for this road, though rarely used, is Netaji Subhash Chandra Bose Road. The promenade is lined with palm trees. At the northern end of Marine Drive is Chowpatty Beach. This is a popular beach famed for its Bhel puri (local fast food). Many restaurants also line this stretch of the road. Further down this road lies Walkeshwar, a wealthy neighborhood of the city, also home to the Governor of Maharashtra. Most of the buildings erected by wealthy Parsis display an art deco style which was popular in the 1920s and 1930s. Among the earliest art deco buildings on Marine Drive were the Kapur Mahal, Zaver Mahal and Keval Mahal, built between 1937 and 1939 for a total cost of 1 million rupees. Real estate prices along the Esplanade are high. Many hotels dot the drive, most prominent among them being the 5-star Oberoi (formerly the Oberoi Hilton Tower however reverted to the original name as of early 2008), The Intercontinental, Hotel Marine Plaza, Sea Green Hotel and a few other smaller hotels. Marine Drive is the preferred connecting road between the central business district located at Nariman Point and the rest of the city. Marine Drive also houses many Sports Clubs along the stretch, mostly members only clubs like the Cricket Club of India, adorning the Brabourne Stadium and Garware Club House adjacent to the famous Wankhede Stadium along with others like the Mumbai Police Gymkhana, P. J. Hindu Gymkhana & Islam Gymkhana. Former singing superstar of 1950s Suraiya lived here in 'Krishna Mahal' in the ground floor apartment from 1940s till her death on 31 January 2004 (as a tenant of Shah family). The house was first taken on rent by her mother Mumtaz Begum. Many other film stars, like Nargis, Raj Kapoor lived nearby in the 1940s and 50s. In 2012, the Municipal Corporation of Greater Mumbai announced that the entire road would be resurfaced, 72 years after it was originally laid. Marine Drive has hosted the following major events in recent times. In 2014, on the occasion of the 65th Republic Day of India, the Protocol Department of the Government of Maharashtra held its first parade on the lines of the Delhi Republic Day parade along the entire stretch of Marine Drive. Mumbai Marathon (every year since) 9 February 2004 — an international marathon. International Fleet Review 19 February 2001 — The world's major navies took part in the IFR. Marine Drive follows the shore of Back Bay. Nariman Point skyline with Air India building in green lightings. View of Marine Drive from Nariman Point at night. Marine Drive is seen as an arch of light at night. ^ "Meher Marfatia: Three s company on Marine Drive". mid-day. 29 July 2018. Retrieved 23 September 2018. ^ Makne, Eknath (22 October 2012). "Marine Drive will be smoother ride soon". Mumbai. Daily News and Analysis. Retrieved 29 October 2012. Wikimedia Commons has media related to Marine Drive, Mumbai. ^ "Marine Drive turns 100, many more to come - Typical Indian". Typical Indian. Retrieved 21 December 2015. This page was last edited on 21 February 2019, at 04:08 (UTC).